In the 2nd century BCE, the Romans became interested in the eastern Adriatic coast and its hinterland, wherefore clashes with the Illyrian tribe of the Delmats begun in the mid of the century. 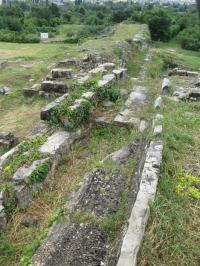 Salona was mentioned in written historic sources for the first time in the year 119 BCE, when consul Caecilius Metellus decided to spent a winter with his army in Salona. 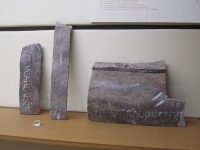 Resulting from the city's fine natural location and a concatenation of favorable circumstances, Caesar advanced Salona to the status of a colony, Colonia Martia Iulia Salona, that, at the turn of the eras, became the capital of the roman province of Dalmatia. 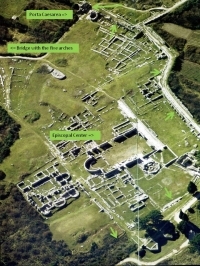 Aerial view to the southwest of the Salona site. 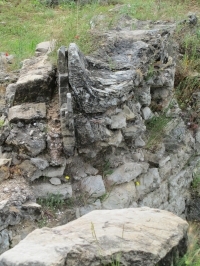 Small arrows indicate the remains of the ancient Roman aqueduct in the neighborhood of the city wall. The longer arrow at the top points at the nymphaeum just south of Porta Caesarea. At that time the city's monumental eastern gate, the so called Porta Caesarea, the forum, and the theatre were erected. 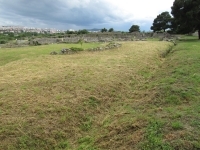 The amphitheatre was built in the 2nd century CE, at the time of a powerful rise of Salona, deemed to have received 18.000 spectators. In the late 3rd century, the time of the emperor Diocletian, the construction activities culminated in erecting of new and annexing of older buildings. At that time Salona was a populous city, with its environments having a population of about 60.000, pervaded with a cosmopolitan spirit. 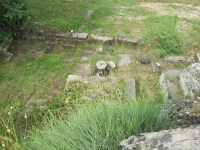 Christianity appeared in the Salona area in the 3rd century. 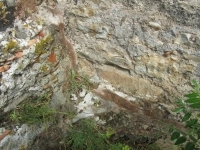 The places where martyrs were buried, Manastdune, Kapljuc, and Marusinac, became places of particular worship, where other Christians were subsequently buried as well above the martyrs' graves where basilicas were erected. 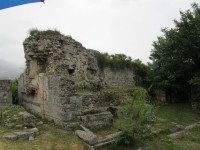 In the vicinity of the place of the first secret gatherings of the Christians, in the late 4th and the 5th centuries the Episcopal Center was built that included double basilicas, the baptistery and the bishop's residence with outbuildings. Two church councils, held in the years 530 and 533, made the last great events related to Salona, which walls could not have stood the numerous attacks of the Avars and the Slavs. The city fall in the year 614 and its devastation made the end of the classical period in these areas. 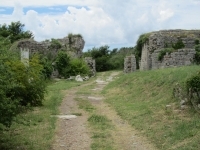 In the early middle ages a new, Croatian Solin developed at the city's outskirts. In the east suburb of Salona, outside the walls enclosing the old city, the Urbs vetus, the westernmost backwater of the Jadro (the ancient Salon) was flowing. In the 1st century BCE it was spanned by a five-arch bridge supported by massive pillars. It was constructed from finely chiseled stone blocks arranged in a regular pattern and bound with mortar. The bridge was situated on an important regional road which was a continu-ation of the old city's main communication, the decumanus maximus. The road was passing through the eastern city gate, the so-called Porta Caesarea and, in the immediate vicinity of the bridge, branched into two roads. One was leading towards the north-east to the so-called Porta Andetria and further into the hinterland, and the other across the bridge in the direction of Epetium (Stobrec) and further southwards along the Adriatic coast. 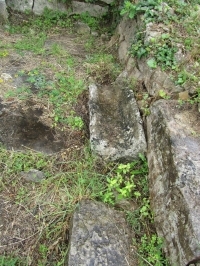 As early as the 1st century BCE alongside this road necropoles grew, many of them being gradually abandoned as the city was spreading eastwards. 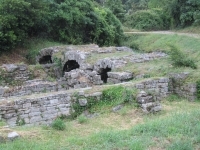 At the time of Emperor Augustus an aqueduct was built supplying the city of Salona with water from the source of the river Jadro. The best preserved segments being the ones extending from the north of the Episcopal Center to the nymphaeum located in the southern part of Porta Caesarea. From the Archaeological Museum in Split. When the city walls were being erected, in 170 CE, a part of the aqueduct extending east, from the Episcopal Center to the Porta Caesarea, was incorporated in the city walls. As the city was gradually expanding - the western Urbs Vetus developed to the east: the Urbs Novus - the Porta Caesarea was losing its function as the main gateway and became a sort of triumphal arch. 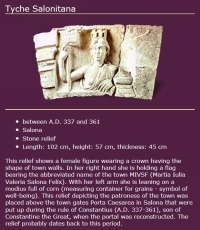 In the 4th century, during the reign of Emperor Constantius, the Porta Caesarea underwent reconstructions, being adorned with new decorative elements containing a part of an arch with a relief depicting Tyche Salonitana, personified as a woman with a crown on her head, holding a flag on which the city's initials: MARTIA IVLIA VALERIA SALONA FELIX were carved. 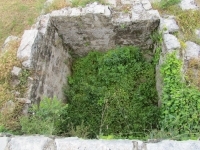 The source for the aqueduct of Salona - the Jadro spring - was the same as two centuries later for the aqueduct of Spalato / Split. 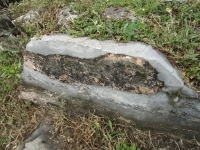 The channel west of the source is difficult to trace because of elaborate excavation works of a local cement factory. 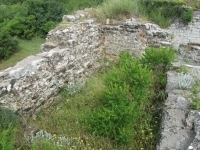 The first trace of the Roman aqueduct is at Majdanu, where only the substructure and the floor of the channel are visible. In the Kamerica area a part of the structure was - at a certain moment in history - in use as a shelter for farmers in times of bad weather. A little further the aqueduct intersects with a modern road and continued to the west, to the Salona site. 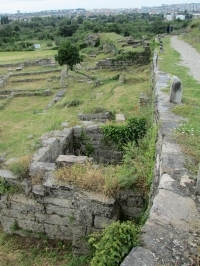 Probes along the course of the Roman aqueduct of Salona (present Solin, Croatia), the basis for new research by K. Marasovic, S. Perojevic, and J. Margeta, see Marasovic (2016). This study was conducted during the first year of the research project 'Ancient water systems of Salona and the Diocletian�s Palace'. In 1999, during the construction of a residential building next to the 'Roman road' about 5 m of the original channel was destroyed. 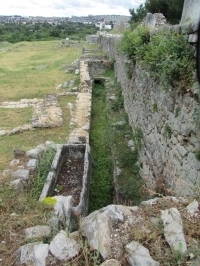 In the northeast part of the present Salona area, the channel entered through the town wall. The total length of the aqueduct was 3850 m. The channel was in general 1,00 m high and 0,80 m wide, and covered with large stone slabs made of Modrac lime stone. Its capacity was estimated 12.000 m3 water per day. 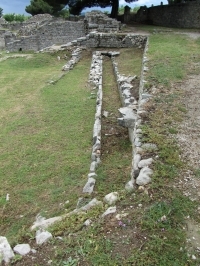 The next segments of the channel can be seen 200 m east of the Episcopal Center, just inside the walls of the Urbs Novus (the New Town, the eastern part of Salona). North of the Center it turned south and was partially incorporated in the new city wall, heading for the nymphaeum just south of the Porta Caesarea. This is also the last point where the aqueduct can be monitored. From here the different wards of the Urbs Vetus (old / western city) were supplied with water through a network of small channels, and ceramic and lead pipes. On a later date a storage basin was built on top of the southern wall of the Porta Caesarea, which had direct links to the nymphaeum below. 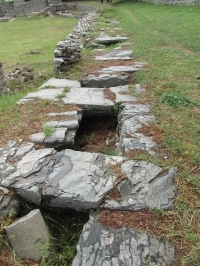 Late antiquity brought a different attitude towards Salona's aqueduct. 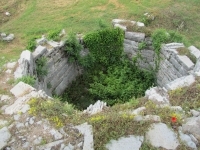 In the 4th and 5th c, on the part of the channel west of the Episcopal Center, circular openings were made where water could be drawn directly from the channel. In this period the monumental towers of the Porta Caesarea were refurbished into water reservoirs which is attested by layers of calcareous deposits. Such large scale alterations and accumulations of water correspondent with the turbulences in the late antique period when many activities were focused on the high risks of attacks by the 'barbarian' Slaves. The Tabula Peutingeriana (Peutinger map) is an itinerarium depicting the road network in the Roman Empire. The original map was last revised in the fourth or early fifth century. It measures about 0,35 m in height and 7 m in length. 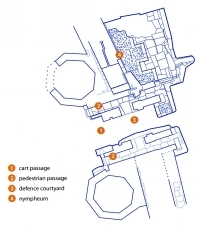 Dr. W. Bruijnesteijn van Coppenraet made this outline (from: De Romeinse reisgidsen, 2006). Distances in Roman miles (1482 m). How to visit : Take the main route between Split and Solin and follow the information signs.